Mat rider, Mary Mills, known cleverly as Surf Sister, takes nothing for granted. She walks the walk and talks the talk when it comes to riding waves. There doesn’t seem to be much B.S. with her and she calls it like she sees it. Everything about her oozes life and energy. And that’s a good thing! A devout student of our many water oriented disciplines, Mary dabbles in everything surf. From mats to surfboards, she attacks them all with equal vigor. Mills uses the same bravado in her other pastimes like skating a ramp or playing music. She seems to always give it 110%. 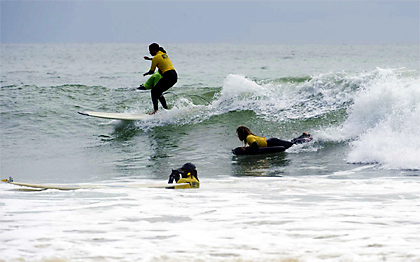 Surf Sister lives a full life, at breakneck speed with a smile on her face and a great attitude. Surf Sister lives in Los Angeles and has been known to search every nook and cranny in the County for the best reefs or sand banks. She has an uncanny knack to see thru the thin veil of the human vernacular with love and respect and keep her feet firmly in the moment while respectful of the past. She does this all with tongue firmly planted in cheek and eyes wide open. UKMS – Hey Mary, What’s going on? Should we call you Mary or Surf Sister? Or is there maybe another nickname? Surf Sister - I answer to both names. I’ve also been known to answer to the nickname Board Whore. Greg Brady’s famous “Hey, Groovy Chick” might make me turn my head. No one’s tried that one yet though. I answer to Mom as much as I answer to anything else. There is a dumb guy at one break I frequent, a guy who smokes way too much weed, who told me on several occasions that he was going to call me “Brown Sugar”. I have yet to answer to that. UKMS - Since I don’t know much about you personally can you give me some background on yourself? Pretty much who is Mary Mills? Surf Sister - What I am: a 50 year old black woman who surfs, rides a mat, skates my backyard mini-ramp rather badly, lifts weights, runs when being chased—not really . . . about the being chased part and plays the drums. Surf Sister - I’m not even sure when I started. Let me go and look at my blog. You know, the reason I started my surf blog was because of my bad memory. Its initial purpose was to allow me to track my progress as a surfer. I came to surfing and the ocean somewhat late in life. The blog has stories to tell about events in my life that are long forgotten. I looked in my blog and it was no help at all! I think I got my first mat in 2008. 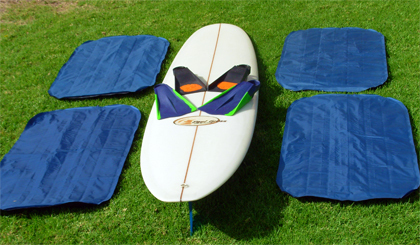 I remember reading the words “surf mat” in some article and being immediately intrigued. Mind you, I’d never seen a surf mat; I had no idea what a surf mat was. Still, those words stuck with me. I knew I had to have one. Then, of course, I couldn’t figure out how to get one. I remember looking for one on eBay and seeing bona fide pool toys. I knew those wouldn’t do. Somehow, though, I found Paul Gross. At the time, he was in the Pacific Northwest, living in the town, believe it or not, where I’d gone to college. We immediately hit it off because we both truly hated that place. Anyway, he made me a 4GF Standard. The rest is history. Surf Sister - I find it difficult to articulate. Although I primarily ride surfboards, I readily admit that what one experiences while riding a mat is far better than what one experiences on a surfboard. I’ve had my mind completely blown while riding a mat, blown to the point of being rendered almost speechless. That doesn’t happen when I’m on a surfboard even though I thoroughly enjoy traditional surfing. UKMS - Where is home now and how often are you in the water? Surf Sister - I live and surf in Los Angeles, California. I average about four or five sessions a week at this point. Unfortunately, the crowds have gotten ridiculous of late. That makes it harder for me to ride my mat, especially with all of the kookiness in the water these days. I don’t mind matting in a crowd of decent surfers; they are skilled enough not to run me over or to get out of my way when I’m flying down the face of a wave. It’s the inexperienced surfers, who pose the greatest risk, and they now outnumber the experienced surfers, it seems. UKMS - What’s your typical wave like there and what about the super days? Surf Sister - Well, Los Angeles, like so much of Southern California, has a lot to offer in terms of beaches. There are both beach breaks and points or reefs. The beach breaks tend to have the worst shape. I will mat a beach break, but I generally do so either for exercise or because I’m tired of riding my surfboard. I can’t say that I enjoy matting a beach break. It’s the points and reefs that the mat loves. The goal for me is to always try to mat those spots before the crowds get too thick. That means arriving at dawn or gambling that a spot will be working even if the forecast is to the contrary. UKMS – Didn’t you surf today? Surf Sister - I surfed L.A.’s most famous break again today. There were only a few of us there who really knew how to surf. We got the long rides. I would really love to ride that wave on a mat though. That will never happen during daylight hours. Ever. The lifeguards don't play that. On a good day, a really good day, a point or reef will give you a face that lets you hit those fourth and fifth gears. Those are the days when you will hear the surfers on the inside hooting for you. Those will be the same folks who were giving you stinkeye when you kicked out to the lineup. Once they see what it can do, and what you can do on it on a big wave, their attitudes change. UKMS - Just how big of surf have you been in and where? Surf Sister - I have no idea how big. My ability to judge the size of waves while on my mat is pathetic. As the saying goes, everything is overhead when you’re riding prone. I’m one of these people who don’t really care about the size of a wave! I’m all about shape. Obviously, for a mat to perform in the ways that I’ve described, you need a wave with some size, probably five feet or more. I don’t name spots in public. L.A. is crowded enough. I don’t like to say where I surf or mat. I might tell people during a face-to-face conversation or perhaps while talking to the mat-riding group on Facebook (since that is a secret group that can’t be seen by anyone who’s not a member), but I generally don’t broadcast my spots. I spend a lot of time trying to figure out swells, tides and crowds. I do the work to make my sessions count. I don’t give that information away lightly. So, I’m not going to say where I prefer to mat and surf. Surf Sister - I’m not sure. I guess I like that it’s different. Believe it or not, I’ve never ridden a boogie board. Ever. I’ve never had an inclination to do so. But the mat . . . now there’s something you don’t see every day. A black woman in the water? You don’t see that every day either, do you? A black woman in the water on a surf mat? The looks I get are priceless. People can’t believe their eyes. The surf mat and I are a good team. Any stereotype that folks have about who and what they’ll see in a typical surf session is completely obliterated when I’m on my mat. Surf Sister - I don’t think you can seriously ride a mat and not have your attitude and perspective change. I think my wave knowledge has been helped immensely by riding a surf mat. Waves look a lot different when you’re down there watching them form. I’ve also found that I’ll ride larger waves on a mat than I will on a board. I have a fear of getting worked and hit by my board in larger waves. There is no such fear when I’m on a mat. My feeling is that you’re already down there, so it’s not like you have far to fall. You’ll get worked, but the mat’s not going to hurt you. UKMS - How has the mat world changed over the last five years with the push of Social Networking? Surf Sister - That’s a very good question. I suppose social media has allowed the tribe to connect more easily. If nothing else, Facebook and the Surfmatters blog in particular have allowed all of us to literally see what’s going on with mat riders in other parts of the world. We don’t have to wonder whether there are others out there who are riding mats. They are posting videos of the sessions they were having while the rest of us in a different time zone were asleep. Social media has an immediacy that is invaluable. Someone can ask about a certain brand of fins and get answers from all over the globe within a few hours. That impresses me to no end. UKMS - What is your go-to mat currently? What’s in your quiver? How often to you go to other mats to try them? Surf Sister - I have a quiver of Fourth Gear Flyers. I carry four mats and two pairs of fins in my car at all times. My favorite mat is the Omni. If a mat can be perfect, this one certainly is. My quiver is composed of a first generation Omni, a second generation Omni (which is my daily driver mat), a 5GF and a Lotus 7. I have no interest in trying other mats. The 4GFs work well for me. I’m one of those people who truly believe that if it ain’t broke, don’t fix it. Surf Sister - After the second mat meet, I started running my mats at a lower inflation. At some point during that meet, my mat managed to make it to shore without me. Andrew Buck grabbed my mat, took some of the air out and said, “You’re ready to move to the next level.” He told me to start riding with less air in my mats. And that’s what I do. If the wave is big, I’ll run the mat with very little air. You can easily fold the mat in half. I generally run at that inflation level unless the wave is on the weak side. That’s when I’ll do the standard amount of air that results in one being able to fold the mat at a 90-degree angle. Surf Sister - I have a set of Viper V5 fins that I like a lot. They don’t have as much propulsion for me now that I’ve gotten much stronger in my kicking. I’d planned to get a pair of V7s until I stumbled upon some Duck Feet at a sporting goods store. I’m now wearing those when I mat. I love them. I’ve tried a few different brands of fins. One issue for me is my narrow foot. I can’t wear Churchills as a result. And I don’t like fin socks. I don’t like socks period; I never wear socks when I wear shoes. The Vipers and Duck Feet are comfortable. I don’t have a need for any other fins right now. UKMS - I’ve found that over the past two years mats, and their designs, seem to have subtlety changed, at least for me. How about you? What’s different and what’s the same? Surf Sister - I don’t have enough knowledge of mat design to know. I’m a relative simpleton when it comes to things like that. I don’t care about a mat’s design. If it works, I’m set. I have no interest in why it works or how it works. I’m not ever going to make my own mat. If I have a question, I turn to Paul Gross for the answer. UKMS - Tell me a little about your travels in the past five years. Surf Sister - I’m relatively poor. I’ve never surfed or matted outside of California. I don’t have the funds for travel. Surf Sister - You know, I don’t really bother to try. I don’t care if people don’t get it. Surf mats are way too confusing for those who only have one view of the wave-riding paradigm. I’m actually quite surprised when a surfer turns and says, “Hey, you’re on a surf mat!” I don’t get that reaction often though. Generally, folks just stare. UKMS - I’m told you’re a musician, a drummer to be exact. Are you any good? Are you in a band? What type of music are you into? Surf Sister - I’m told I’m pretty good. I’ve only been playing for a couple of years. My skills are still developing. It’s difficult to find time to practice when you have a kid and a job, but I manage to squeeze in some time. I think I’m in a band now, yes. I recently put an ad in Craigslist, looking for other older musicians who want to jam. I got quite a few replies. I hooked up with a guitarist and grabbed my friend for vocals. Now, a fellow surfer has said he wants to sit in on bass. I’m not sure what to call this. I think it’s safe to say it’s a band though. 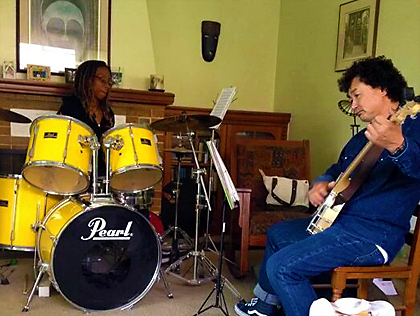 I also have a jam session once a week with a friend who plays the bass. As for the music I like to play, I seem to default to James Brown beats when I’m simply sitting at the kit for the fun of it. Clyde Stubblefield was so rock solid with his beats. I love his playing. When I’m with the band, we play rock and roll. I’ll know my skills have truly improved when I can play something like Led Zeppelin’s “Out on the Tiles” with ease. Surf Sister - Oh, you mean the blog with the ever-changing title? I started writing it in 2005. I rarely post anything to it now. I’ve run out of things to say about my surfing journey. I’m at the point where I’ve learned so much and surf so much that I don’t feel a need to record all that happens. For many years, though, the blog was like a close friend. It really reflects a lot of the wonder that surfing held for me. There’s good, bad and ugly in it as well. Even though it’s a blog about surfing, people who are considering, or who have had, a knee replacement, have really read it quite widely. In 2009, when I found out my knee would have to be replaced, I made a conscious decision to allow the blog to tell my story to the outside world. There was no paper trail for me to follow when I was desperately searching for information. I was fearful that I wouldn’t be able to surf again after the surgery. I was worried about the pain. I had many, many questions, and nowhere to turn for answers. I decided I would leave a paper trail for younger athletic folks who would eventually follow me down that joint replacement path. I think that alone has made all those years of blogging worthwhile. UKMS - And what was the reaction? Did People/athletes/surfers come back and give you feed back? Surf Sister - I got a great deal of feedback during my recovery from the knee replacement. Obviously, the surfing community was closely following my progress, not so much because they had any interest in knee replacements but because people cared about me. Blogs, during their heyday, helped people connect with one another. Now, of course, we have Facebook and Twitter and the like for that. Before social media, blogs were the way that many of us communicated with our respective tribes. I can’t even tell you how many friends I’ve made as a result of my blog. The people who followed the blog closely were communicating with me throughout my recovery. I’m not sure how long it was after the surgery that I began to hear from both surfers and non-surfers who had found my blog. Many people wrote to me for advice and support, which I gave freely. Several surfers contacted me, thanking me for what I’d written, saying it made them less fearful about their futures. Knowing that I’d had the surgery and had returned to surfing rather quickly made them less hesitant to get the surgery done. I also heard from non-surfers who had questions or who expressed appreciation for the blog. There is a widget on my blog that lets me see what search terms led people to the blog. Most of the time, people get there through surf-related searches. There are, however, many searches that pertain to knee replacement questions. I could easily have kept my pain and suffering—and that is not an exaggeration—to myself. I wasn’t fishing for sympathy or anything. I just figured that sharing my story would help a lot of other people. UKMS – The Prono Paradiso meet in Australia seemed pretty cool? I noticed on your blog that you had a link to it. The video was done really well. Weren’t you in the last couple of mat meets here in Southern California? I think there was one at Cottons Point and another at Leo Carrillo. How were they and what did you come away with? Surf Sister - The Cottons mat meet. Good times . . . once I realized I would live to mat another day. The best thing I got out of that mat meet, other than having that mat riding epiphany when watching Mattitude drop into a bomb, was a photo of me being absolutely crushed by a wave. I didn’t find it amusing at the time; both the mat and a fin left me when that wave struck. Now, I look at that photo (below) and hoot with laughter. The other mat meet was a day of perfection. We had so many people out there on mats. Dirk rode his mat like a boss and filmed the meet. Matt was there showing us all how to truly dominate a wave on a mat. Andrew Stephen Buck, who can and does catch everything, was doing his thing. It was a great day in the water. I remember laughing a lot that day. I think it’s almost impossible to have a bad session with other mat riders. That’s probably because mat surfers are very supportive of one another. Surf Sister - I’m pretty much a two trick pony. I ride surfboards. I ride mats. I have a handplane. I’ve tried to ride paipos. Those things don’t give me the thrill that I get from the mat and single fin surfboards. I’m a big believer in making the best use of one’s time. I’m happy to stick to mats and boards rather than trying to master something else. UKMS - Did you grow up surfing, knee boarding, Boogs. Etc. and where did you ride your first wave? Surf Sister - I didn’t grow up surfing. I grew up wishing I could learn how to surf. I’d see surfing on Wide World of Sports and just be captivated. I didn’t really learn to swim well until I was 23. I was 38 when I finally started surfing. I’d been a competitive cyclist for years prior to that. UKMS - How do the crowds handle mats in the LA lineups? Are mats taken seriously? Surf Sister - I don’t ride my mat in a crowd. Doing so is pointless. I don’t have a death wish. There are a couple of spots where we will go to get away from the crowd and mat in peace. We can’t do it often though because it’s a bit of a hassle, in terms of time, to get to these spots. It doesn’t matter what you ride in a crowd in L.A. You are going to get dropped in on whether you’re on a surfboard or a mat. That’s the problem with living in a big city where too many people fancy themselves surfers. UKMS - In such crowded lineups how have you dealt with others? Steve Senese’s son, Corey, surfed with you in the Malibu area last week and he had to comment to me about it cause you had such a big smile on your face? Surf Sister - Prior to that session, I would have said that crowds truly put a damper on my mat sessions, especially if I’m at a spot with a small takeoff zone. I need to rethink that belief now. A few days ago, Clay and I mounted a dawn attack on an L.A. break that is perfect for mats. This was probably the first time that I willingly battled with surfers for waves. I don’t surf with anger. I never have; I hope I never will. I do, however, get irritated when people continually back paddle us when we’re on our mats. We were getting good rides before the crowd got thick. Once the takeoff zone had more than 10 people, it got difficult to catch waves. I don’t get mad. I know there’s not much I can do in retaliation on a mat. What helped today was that there were two experienced surfers who were out there just killing it. One of them told me to feel free to jump on a wave when he was on it. See, it was one of those days where the lineup was extraordinarily kooky, so these guys kind of set the tone for how things were going to go even though they never said anything negative to anyone. They were taking every wave they wanted to take and the other surfers would get out of the way. These guys would get their rides without anyone dropping in on them, but we weren’t given the same amount of respect. Well, once that guy told me he was willing to share, it was on. He and his friend had set the tone for the session. Waves would come. He and his friend would take them alone. Then, more waves would come and every kook in the lineup would start paddling. I normally won’t go then. I don’t trust the abilities of folks who buy pointy boards, but can’t surf them. Still, the waves were good and I was not willing to admit defeat. At one point, a wave came and I decided to go. Someone even called me into it. Of course, quite a few others went as well. I got it. You know what the best part was? I took out two surfers on that one wave. One was on the inside trying to paddle for it while I was already on it. I had nowhere to go and ran into, on top of and over him. That stopped my progress enough to run me into someone to my left who was up and riding. I inadvertently banged into his legs and took him down. And you know what? I thoroughly enjoyed that. I am probably one of the most polite people you will encounter in a lineup. I wait my turn (whether on a board or a mat). I call others into waves. I cheer for others. I enjoy my water time immensely. I’m happiest when everyone in the lineup is having fun. But, hey, if people want to keep disrespecting me—or, in this case, us—while we’re on our mats, I’m not going to take that lying down. (Pun intended! AHAHAHAHA!) The guys are more apt to get in there and mix it up with surfers while we’re matting. I’m not normally one who will do that. Today changed all that. To answer your question more pointedly, I’ll admit that I truly dislike surfing or matting in crowds. I do my best to go where the crowd isn’t. In any case, I’ve grown accustomed to the crowds. You can’t live in a city of this size and get away from crowded lineups. When being in the water with the masses starts getting to me, I take a day off and do something land-based. Surf Sister - The word “flail” comes to mind. I did a lot of flailing. That’s why I didn’t ride the mat much at first. I could not get the hang of it. I didn’t truly take the mat seriously until after my knee replacement in 2009. That surgery made me appreciate all that I have physically and all that I’m able to do. Your attitude about life changes when you realize the things you love can be taken away from you at a moment’s notice. Had I not gotten my knee replaced, I’d be disabled by now. Once I got the new knee, I never looked back. I’ve always been athletic. The knee issue made me realize that my body will eventually wear out, so I need to make the most of my good health while I have it. Surf Sister - The technique has come from both my own trial and error as well as from watching others. Actually, one mat moment that sticks in my mind clearly was from the first mat meet. The waves were big! I was scared to death. I nonetheless got myself out to the lineup (without knowing how to duck dive) because I knew I needed to see people ride mats up close. I remember being next to James when a bomb came. He offered to let me take it. I quickly declined his offer, so he took it. I can still picture him dropping into that wave. See, I had no concept of how you actually got into a wave on a mat. When I saw James bend that mat over and drop in, it was a true Eureka moment! That’s when I began to understand the mat. I really enjoy watching Matt Pierce ride a mat. I think some of my mat riding style comes from trying to emulate his riding style, too. In the end, I figured it out on my own. There was a day when it finally clicked. I sent Paul a photo from that session, not thinking much of it. The subsequent Surfmatters blog post had that picture and a question: “Who are you and what have you done with Surf Sister?” Those words brought home to me the fact that I’d figured out how to ride my magic towel. UKMS - Are you a solo session mat rider or are there other mat surfers in your immediate area? Surf Sister - I prefer to ride with others, but generally have no hesitation about going it alone. Tremor and I have shared many a session on our mats. We laugh about the fact that I almost always run him over during a session. In our last session, we accidentally played bumper cars on one wave. I then decided I would try to knock him off a wave if I got the opportunity. A good-sized wave came. We both dropped in. I remember looking at him, flooring it and then slamming into him at full speed. Of course, it was a mat-against-mat slam that resulted in us both howling with laughter. I think we both got knocked off that wave by that collision. It was great. These days, I mat with Tremor and Clay, a friend who took to mat riding quickly. We seem to be our own little mat riding crew. UKMS - How much has Paul Gross given to you in terms of advice and mat tips? Surf Sister - My relationship with Paul transcends mats. He and his wife are two people to whom I’m very close. Yes, Paul is the reason why I was finally able to get on a mat. He’s also the reason why I’m on the hulls that I surf. He’s the reason why I no longer fear the lifeguards (since matting in L.A. County is technically illegal). He’s even the reason why my drumming has gone as well as it has since I started playing two years ago. Paul told me early on that I needed to take lessons to keep from developing bad habits. He was right. Surf Sister - I rarely lose my mat. My inflation is low enough to allow me to keep a good grip on the mat. I’m quite talented at pearling on my mat though. Surf Sister - Is there a current mat buzz? I’m actually somewhat out of the loop. I don’t keep up with all that’s going on or being said in the matting world on a day-to-day basis. UKMS – What would you like to see happen in the mat world in the near future? Surf Sister - I’d love to see mat meets where we’re able to take over a break and completely dominate it. That’s what we did at the mat meet in L.A. some years ago. We actually outnumbered the surfers at some point. That was an empowering experience for all of us, I think. I’d love to be able to do something like that at least once a year. UKMS – Mary, many thanks for giving us your time.